Stunning single level in desirable Crimson Point. 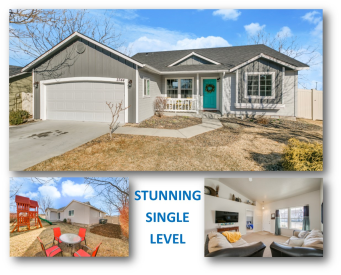 Meticulously maintained by original owner "McCall" w/4 bed/2.5 bath + Bonus & Custom Rec Rm! Bonus w/built-in cabinetry! Garage converted to finished rec rm w/heating & air, added windows, own entry & extra half bath, use as play room, in-law quarters, daycare or ? Vaulted ceilings, open kitchen, new exterior paint & more. Fully landscaped N. facing rear yard w/shed, play structure, vinyl fencing & No rear or east side neighbors. Next to community garden & school. Walk to pool or Indian Creek! Great Location!